Ut visum notitia bona id temporis. *According to Google Translate. Any Latinists, please assist. Here are some pictures of the renovation of Saint Boniface now well underway. I hope you enjoy seeing this. But you won't be able to see the whole package deal until Easter! This is the artist's original proposal for the interior of Saint Boniface. I had him create this in 2006, as a "someday" project. Since this original proposal (and this photo washes out the colors), we've changed our plan. The ceiling over the sanctuary has been done in a very different fashion, we decided to add a tile floor in the sanctuary, and a hardwood floor in the nave; and we also decided to have six images of saints painted and displayed on the wood paneling behind the altar. The ceiling has been decorated largely as you see, as have the walls. Also, this picture isn't intended to give an accurate depiction of the sanctuary as it was or will be; the artist was focusing on his recommendations, not on the pulpit (which is missing) or the altar, which wasn't being changed. Here's a picture of Saint Boniface as we began the work. The Nativity Scene (with the Magi just arriving) reveals the day: January 2, Epiphany. That Sunday a crew of parishioners came in and hauled out everything that needed to be moved, and we began taking up the carpet. The windows you see were restored over the past three years by the same artist who is doing a lot of detail work in this project. Oh, if you're wondering about those stations of the cross...some years back it was the fashion to take perfectly lovely works of art in churches, that were full color, and paint them mono-color. You won't believe this, but the theory was that having art that was so beautiful was a distraction; painting them over like that was the compromise in order to save them. Thankfully, the iconoclasts have been overthrown, and in many places these unfortunate decisions are being reversed. We have a plan for restoring them to full color, that arose as we began this--but we can't do it by Easter. Something to look forward to. Here we are hauling out the original pews. We had a lot of discussion about whether to replace them or restore them. These were badly damaged over many years of being moved (one more problem with carpeting churches); as we moved them, two out of every four fell apart, and the third was only prevented from falling apart by those carrying it, leaving one in four that kept together. A lot of those had very bad cracks and splits. The cost of refurbishing them exceeded the cost of new, and refurbishing them would have left them with many remaining problems to manifest down the road. The new pews will be similar in style and identical in wood and stain. Folks asked me, "will they have kneelers?" I'm thinking, "folks, this is me!" But I just smiled and said, "oh yes." The new kneelers will be pitched at a better distance from the back of the pew, making it easier on parishioners' backs. Yes, that is yours truly on the left, wearing a Piqua Catholic sweat shirt. If you're wondering why I'm not in clerical attire, I believe I was wearing my cassock, and judged it prudent to remove it for this sort of work. You know me, a big liberal! Say goodbye to the carpet. After this carpet was taken up, we laid down plywood as a sub-floor, and have installed a tile floor (on top of cement board) in the sanctuary, and are--as I type!--installing hickory wood in the nave. We'll keep carpeting in the vestibules, in the sacristies and the stairs. The choir loft is getting a vinyl flooring. Actually, the carpet wasn't in terrible shape, and if we didn't have to paint the church, and if we didn't have pews desperately in need of replacement, this carpet would have lasted awhile longer. But we decided that if we were going to do all the other work, why not take up the carpet--as opposed to coming back, in a few years, and removing the new pews (expense and damage!) to replace it then? This carpet was laid by a parishioner who has since gone to his reward, Luke Holscher, who in addition to being an outstanding carpet man, was a hard worker at bingo and an intense player of Bid Euchre. Before he departed this life, I used to play cards at his house with his wife and some bingo workers; they'd start at 10 pm on Sunday and go till about 3 am! (Part of the reason we went so late is almost every hand was analyzed right after! I can still recall Luke arguing about how a partner played his hand!) Then we started earlier, and still went pretty late. The rest of us have gotten together a few times since Luke left us. Luke did a splendid job laying this carpet--it was flat and tight, no ripples, and it came up easily. Requiescat in pace. 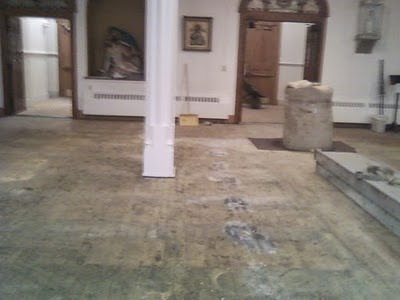 Here is the church after the pews and carpet have been removed. That is, we think, the original floor. Before it was carpeted, it had linoleum tile, which was removed at some point. If you look closely, you may be able to see a row of circles in the floor; this is where the gas lamps were at one point. Wouldn't it be cool if we still had those? The odd bundle of carpet is our baptismal font. Why didn't we move it? It's three pieces of solid, antique marble, that's why. We used the old carpet to wrap it up safely as you can see. FYI, this font came from Assumption Church in Walnut Hills, in Cincinnati. After some cleaning and some slight modifications, we placed it here a few years ago. And, by the way, we have actually moved the font since this picture was taken in January. Now that we're installing a new hardwood floor, we had to move it. A parishioner with the right kind of equipment did it early today, while I, happily, wasn't here to witness it. In the background you can see the image of our Infant King, which was restored to the church a few years ago on the Feast of Christ the King. Parishioners have noted that many good things have happened for us since that restoration. No, we don't dress him. Here are some of the statues in process of being restored. The statue of our Lady, to the left, was in our 24-hour Eucharistic Exposition Chapel for 20 years; we wanted to bring it back to church, and another lovely statue of our Lady took its place. This statue has since been repainted in richer colors than you see here. FYI, these three statues were on the old high altar that was, alas, destroyed many years ago. A fourth statue, of Saint Clare, is in our all-night chapel which is named for her. Here's how the apse ceiling--i.e., the sanctuary--looked for many years, until this renovation. (Actually it looked better than this picture, I think.) When we announced the renovation, one of the comments folks made was, don't change this! So our plan was to replicate this as you see it, only with brighter blue and gold. Then, when the artist was installing one of the stained glass windows here, he saw this ceiling up close, and beckoned me up on the scaffolding. In my cassock, I climbed up and he showed me the indentation of the crosses, pressed into the metal. We wondered what it might look like. So we decided to strip part of this paint away, and then decorate part of it as it might look. If you look closely at the right side of this picture, you'll see a patch with bare tin, and then a patch with the "new look" that partially restores the old. Then we invited parishioners to vote: and they chose the "new/old" look overwhelmingly. Here's the nave ceiling with the base coat of blue. A lot of folks didn't like it when they first saw it, but this was before the ribs were painted and the gold stars added. Everyone who has seen the ceiling now loves it. The ceiling is all metal; a lot of folks seeing those ripples, thought the ceiling was covered with paper. No, it's just how the metal is shaped, and I don't think we can do anything about it. The stars help conceal that. Here's the apse ceiling with the new/restored look, still in process. It's "restored" insofar as the crosses were there all along, but had been covered with the design you saw earlier. We think they were gold way back when, but we haven't found a picture to verify it. It's "new" insofar as before, this ceiling was probably gold-on-tin, not gold-on-blue. The whole ceiling is all metal; but now that this is complete, those who've seen it think these ribs are real wood. OK, here's an update which will appear in an upcoming bulletin. Sorry to be so preoccupied. Ø Our friends at Brian Brothers have completed most of their work, but have a few final details. They have been great to us, as always. Ø Michael and Ann Blanck are continuing their detail artwork on the walls. The ceilings are—but for the inevitable “final touches”—complete. Ø A friend of Father Ang’s is working hard on our statues. She is doing this at no charge—simply as a gift to God. Ø Celia has lovingly restored the three statues that were in storage for many years, as well as St. Joseph and the Blessed Mother, and the Sacred Heart statue, and the body of our Lord that is on the crucifix. The angels that hold the lamps have also been repaired and are being repainted. Ø We hope to be able to restore the statues of St. Anthony and of Mary holding her Son’s dead body as well. Pray for Celia and her family who are helping with this! Ø A crew from the Floor Store of Versailles is finishing the tile floor in the sanctuary, and just starting on the hickory plank floor in the nave. This is why we relocated adoration to St. Mary until April 6. The pounding from two weeks ago was the sound of installing a substantial sub-floor that has made our floor stiffer, more level, and should eliminate most squeaks, at least for a while. Ø Bob Paulus, whose company this is, gave us a price that earns him little in worldly riches, may God bless him with eternal wealth for his good price! We will be calling on a crew of helpers to install the floor in the balcony before long. Ø The carpeting in the vestibules, sacristies and on the stairs will be installed soon. Ø The bathrooms have been painted and the sacristies will soon be painted. Ø New light fixtures have been installed in the sanctuary; brighter lighting will also be installed in the back, and the remaining fixtures will also be brighter. If we decide we want still more light, we can make further improvements. Ø Our new pews will arrive in a couple of weeks. Ø Soon Michael and Ann will hurry home to Wisconsin to complete the paintings of our six saints we are adding. We’ve asked a lot of them and they’ve worked hard. Ø Holy Week will be busy as everything comes back together and we handle all the last-minute items. 1. Reopening of the church at the Easter Vigil, Saturday, April 23, 9 pm. This Mass is lengthy, as we recall God’s plan of salvation from Adam and Eve to the Second Adam, Jesus Christ. We will have a group of women, children and men baptized, confirmed, received into the Church, and make their holy communion. It will be “high church” (incense and chant). 2. Blessing new artwork and restored statues, Sunday May 1, 10:30 am. This is rescheduled from Easter Sunday. This solemn blessing (with incense) will add perhaps 15 minutes or so to Mass, but will be a one-time event. It was rescheduled to avoid trying to do too much on Easter. As we are honoring several new saints’ images, invitations will go out to folks with a special interest: to the Sisters of Charity for Mother Seton, to Franciscans for St. Francis, and to the Hispanic and Mexican communities for Blessed Jose. I have no idea who may want to come, but it occurred to me that our Mexican brothers and sisters might be very joyful to have one of their own honored here in Piqua, so we may have some new faces and voices at Mass. Let’s welcome them! 3. Open House for whole community Saturday, May 7, 11 am. This, too, was rescheduled (from April 30). This will be an opportunity for anyone who may be interested in a closer look at the church, as well as the sacristies and choir loft. Here’s an idea: do you know folks who haven’t come to Mass? Or maybe you know folks who aren’t Catholic, but maybe you’d like to share our Faith with them in a friendly, non-threatening way. This is a way to do it. Invite them to this Open House. I plan to be there, along with others involved, to answer questions. Everything is coming together! Please pray for those who have a lot of work to do, especially Mark Pitsenbarger and our many contractors and volunteers. Please pray for all those whose generosity made all this possible. I saw it, I liked it; I like the video at the link (click title). OK, I've got to get going soon. Fish Fry at St. Mary's till 7 pm. Couldn't make last week due to responsibilities, and I am the pastor! Busy day here..."the Pile" is growing. To riff off a line of President Reagan's about the deficit, I'm not to worry about this pile, it's big enough to take care of itself. > Had some meetings with folks about personal matters, obviously can't describe them. But I'm praying for them. If you ever wonder what to pray for, or what a priest does, keep this in mind. Some folks bring me serious stuff and I wish I could do more to help. > Wrote a couple of news releases and worked on a handout, related to the re-opening of Saint Boniface Church at Easter, after our renovation. Trying to plan out the celebratory events. The handout gives a complete accounting of all the saints and all the artwork in the church, including the statues being returned to church after their exile 40 years ago, and the six new images of saints which will be added. The handout is intended to be a "keeper" for all those who wonder about the images, what saints they are, etc. > Checked on the progress of the work. The tile floor in the sanctuary is almost finished (may be finished now); the painting is progressing nicely, but still a lot to do. The statues being restored are awesome--and being done for free! The hardwood floor for the nave is going to be installed starting in about 10 days. Many more details to work out. Pray for our director of maintenance who is superintending all this, keeping me sane--er, well, as sane as I may happen to be at the moment. By the way...did you know that on Solemnities, the rules of fast and abstinence are not obligatory? This is the Vigil of St. Joseph! Don't anyone tell the folks at the Fish Fry, where I'm headed next! How sad that Father Martin Fox missed the whole point of Mr. Daley's well-written column (Letters, March 4). In its concern for ecumenical dialogue as well as relationships with non-Christian religions, the Second Vatican Council made bold steps toward eradicating centuries of hostility. The documents from this Council clearly indicate a broad interpretation of the formulary of St. Cyprian: extra ecclesiam nulla salus (outside the church there is no salvation). In his opening remarks, Mr. Daley cited this phrase with the explanation that a very narrow interpretation had dominated Catholic thinking for many centuries. Such thinking hindered any kind of dialogue with other Christians, much less non-Christians. However, a broader understanding of this phrase was enunciated in a letter from the Holy Office to the Archbishop of Boston in 1949, which became the foundation for further exploration in the Second Vatican Council. That "open door" led to fruitful discussions and relationships with other denominations and religions. While there is not sufficient space here for a more detailed discussion, Mr. Daley's use of the the phrase was most appropriate. And he was right on the mark by noting that the Catholic Church has taken a leading role in promoting interreligious dialogue. This, too, is one of the things that keeps me Catholic. Michael Daley, a religion teacher at St. Xavier High School, began his article in the Feb. 25 edition of the Telegraph with the phrase Extra ecclesiam nulla salus — outside the church there is no salvation. In the column that followed, it did not seem to me that he explained what this means to us as we continue to teach this as a doctrine of our church — which we do. Yet without further explanation, it certainly gives rise to confusion. So what do we mean when we say that? “Outside the church” refers to the Body of Christ understood in its fullest sense. We don’t know how many will be saved ultimately. We hope for vast numbers, but we don’t assume it will be everyone. But whoever is ultimately saved will be members of the Catholic Church in eternity, whether or not they are full members in this life. Likewise, reason tells us that if someone rejects Christianity — or the Catholic Church in particular — because of misinformation, then Christ knows the difference between that, and someone who rejects the truth, yet knowing it to be true. Here is what Vatican II said: “This Sacred Council...teaches that the church, now sojourning on earth as an exile, is necessary for salvation. Christ, present to us in His body, which is the church, is the one mediator and the unique way of salvation. In explicit terms He himself affirmed the necessity of faith and baptism and thereby affirmed also the necessity of the church, for through baptism as through a door men enter the church. Whosoever, therefore, knowing that the Catholic Church was made necessary by Christ, would refuse to enter or to remain in it, could not be saved” (Lumen Gentium 14). Whoever is saved, can only be saved through the merits of Christ, and will be united with Him. No one can be united to the head, yet not part of the body: so those who will be saved will indeed be, not “outside,” but “inside” the church. The question remains, does it matter whether we are full members of the church in this life? Certainly. Baptism matters. The sacraments are powerful helps to salvation, as is the teaching office (i.e., magisterium) of the church. More help is more help. God acts in the lives of those not full members of the Catholic Church, and He knows their hearts. Seeking Christ in His church is a wiser course. > I didn't miss the point of the original article; I didn't address it all. I simply observed that the author didn't really address the meaning of the "extra ecclesiam" doctrine. I think that's a statement of simple fact. > I am certainly aware of what the Second Vatican Council had to say, as I quoted it. > It could be that Father Kellerman thinks I was finding fault with Mr. Daley's column. Well, re-read my letter and please show me where I criticized Mr. Daley's essay? I suppose the very fact that I wrote the letter seems an implied criticism--i.e, that Mr. Daley ought to have explained the doctrine. Well, OK, maybe he should have, or else handled it differently. But columns need to be brief, so adding such explanations are hard to do and I don't blame Mr. Daley for not explaining it. And if my letter didn't need to be brief, I might have said as much when I wrote the Telegraph. > In any case, the question of Church teaching on salvation "outside" the Church does often gives rise to misunderstanding. Or so I have found; perhaps Father Kellerman has had a different experience. I offered some clarity, which as far as I can tell, Father Kellerman finds no fault with. > I'm sorry to hear Father Kellerman is sad. I hope he cheers up! Sorry, I'm a little late in posting ("yeah, over a month late, Father! "), sorry about that! Lots going on. Each parish has big projects underway: two construction projects planned at St. Mary: a new gym floor and a new roof on the school; St. Boniface Church is being renovated, to re-open Easter; we are having an outreach to our parishioners this Sunday: volunteers are going out visit their fellow parishioners, simply to greet them and see if they are doing OK. And in April, we have a parish mission (April 9-13) with Father Nathan Cromley. All that on top of normal parish and school business. > I proposed a theme of "spiritual combat" to look at in relation to the readings. > I talked about the incongruity of almost everyone, who is surveyed, professing belief in God, but something less believe in the existence of the devil. Yet I think I would have an easier time proving the existence of the devil than of God. Why? We often ask, "where is God?" The Scriptures are full of that expression. But who needs me to prove evil exists? How does one explain such colossal evil, such as the gulags and the Holocaust? > Notice how our Lord prepared for spiritual combat: he fasted. Odd, that; a soldier wouldn't do that before battle, would he? But this is different. Our Lord first conquered the distraction of hunger. We fast for the same reason: we learn in giving things up just how much power those things have for us. Am I the only one who thinks of a hamburger on a Friday during Lent (laughter); apparently not! But is the flag I'm going to live and die for? The hamburger? > Notice that the devil is excellent in argument and he can quote Scripture. If we try to debate with temptation, we will lose. > Not only do we sometimes underestimate the power of evil, we sometimes overstate it. Notice the devil did not know who Jesus was: "If you are the Son of God..." He was trying to find out who this Jesus really was; and notice Jesus did not fall for his tricks and left the devil knowing no more than before. The devil is more powerful than we are, alone; but we are never alone! When we were baptized, we are clothed in the armor of Christ, who stands with us and enlists us in his work. When we are overwhelmed in temptation, we turn and look over our shoulder and ask, "Lord, please help me!" And he speaks the word, "begone!" > We may not realize we are in spiritual combat, but we are--all the time. The outcome, in one sense, is certain: Christ has won; and yet the outcome for many souls, and for our own, is not. The altar is a battlefield: Christ our champion goes into combat for souls and he calls us here because we aren't mere spectators, he counts us to join the battle. Example: a woman called the parish office just over a week ago, Sister ran in and said, "you have to take this call" and so I did. She told me she was going to have an abortion, she didn't know what to do. I began talking to her, to calm her down and I wanted to get her going in the right direction. Then the line went dead. I didn't have her number to call her back. I don't know what happened. Do you think I have been praying for that woman since then? Do you think there's spiritual combat going on? > I addressed a point to men, specifically: you have sisters, girlfriends, wives, mothers, daughters. Would any of you turn to them and let them go into battle in your place? Of course you wouldn't. Yet notice that is exactly what Adam did in the first reading. He stood there while his wife was under assault and said, and did, nothing. How different it might have been had he simply spoken up! Men, you are here; you recognize your spiritual responsibilities and I commend you. But we know that when we gather for Mass or other prayer, a lot of our men are absent; they are letting others go into combat in their place. > I don't recall just how I concluded my homily, except to talk about bringing the people and cares for which we are doing battle, to the altar, to ask Christ's power and intercession for them. I gave this homily four times, and it was a little different each time as you might imagine.